How to cancel subscription payments? - your website URL, where you have used guteURLs Preview Box. - your received token (licence key). I reveived a licence key/token. What now? Open your Wordpress Administration area. Then you can enter the licence key. For testing reasons it is free. - and maximum 5 boxes on your website. Is it possible to remove the text "guteurl.de" in the widget below the image next to "read full article her"? Yes, it is possible for customers, who have th €7 or €19 subscription. This must be requested per Email, then I can configure it. I do not see the GuteUrl button when creating a new post anymore. It works fine, but it seems to have disappeared. 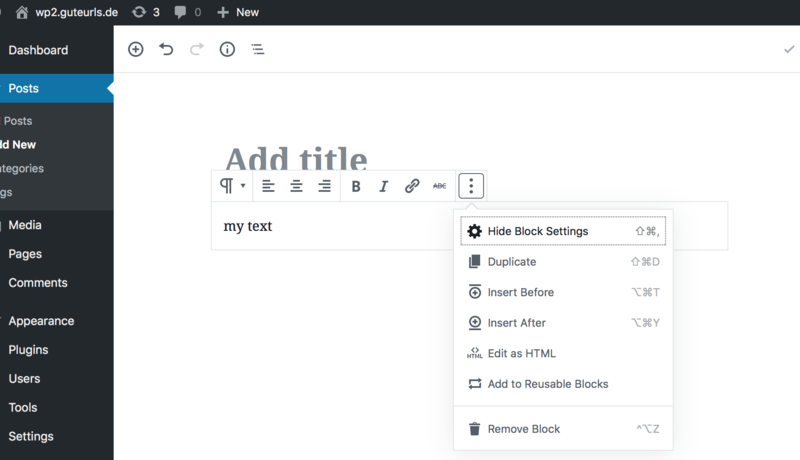 The new Wordpress has exchanged the editor. I haven't had the time to write a component for this new editor named "Gutenberg". Use the previous text editor. Just search for the plugin "Classic Editor", install and active it. and select "Edit as HTML". at the place, where you want the preview box to be. In case the "Classic Editor" is active, perhaps the user clicked on the "Text" - Tab. In that case the "URL Box" item disappears. If he clicks on "visual", then the button should appear again. Do I need a "Private Policy" chapter / "Cookie" hint on my homepage? Yes, we are using Cloudflare as CDN, firewall and reverse proxy for very fast speed. Cloudflare adds a "security" cookie to every http(s) response. With these cookies they are able to protect us from hackers and BOT-networks. And we use Cloudflare as "Content Delivery Network" (CDN) = distributed cache. if you link to a third party within the "GuteURL Preview Box" e.g. to Facebook or Twitter, then the third party (e.g. Facebook/Twitter) will deliver the image and html snippets for your website. They could set Cookies too, log your visitors and can track everything on your page. Be aware of this and add this information to your "Private Policy" page.